Present in almost all of Brazil, the Copacol products are also exported in the 5 continents, more than 60 countries. Since our founding in 1963, we grow and developed relations from the field to our consumers, ensuring taste and quality that can be approved in your meals. Our quality is guaranteed with a modern poultry production system fully integrated, which allows the traceability of the field to the final product, ensuring the high quality of our portfolio. Valuing food security of the products we commercialize, respecting the cultures and enhancing the life quality of all people, Copacol operates more than 33 years now in the foreign market with chicken products. Technological investments, the incubation process of the eggs, advanced technical support, slaughter, processing and marketing, together with ISO 9001, BRC - food and HACCP(Hazard analysis and critical control points) certifying Copacol not only as a capable industry of food products, but as a specialized and safe company to meet the demands of the world, including the most demanding markets. We are proud to bring you what we do best, and our thanks for inspiring us every day to do better. 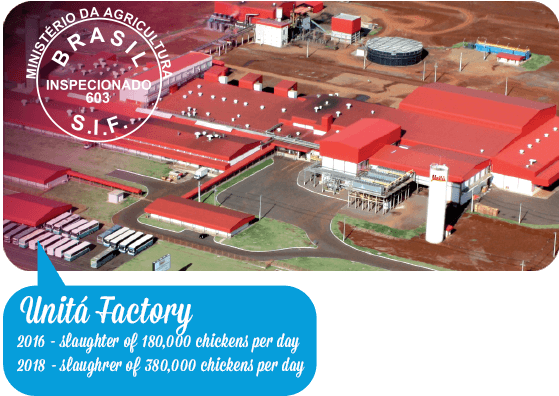 Poultry business is present in Copacol since it started in western of Parana State with a project called Integrated Poultry Complex and today corresponds of 60% of the annual turnover of the company. To keep the best quality and taste of the product recognized in the world, Copacol has all the know how necessary from the production process and logistics until the commercialization. There are more than 1.100 aviaries built and 900 members in the poultry business, the members can count on the diversification in their properties to continue in the farm business, including also fish, milk, pork and grains. The high technology used in the aviaries allied with the technical assistance to these members allows the best results with respect to the animal welfare. The investments of Copacol on the automatic machinery in the slaughterhouse ensure more aggregated value of products to attend the most demanding markets in the world. Copacol produces 31 thousand tons per month to be sold in the domestic market and for export, besides the whole chicken, it's produced many cuts including fresh, frozen, seasoned and processed products required by different customers. From the 8.404 employees working in Copacol, about 5.000 work in the slaughterhouse. Counting with a rigorous quality control, specialized techniques in cuts with the support of technology, Copacol guarantees the quality and safety of its products. Very well structured, Copacol has capacity to store 6 thousand tons of products and an efficient logistics. Copacol is among the top agribusiness companies in Brazil, which makes the products a reference in Brazil and the world, with an anual turnover of almost R$3,500 billion Reais. 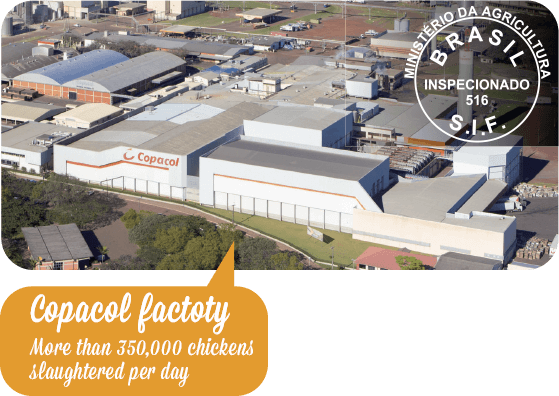 Copacol (Cooperativa Agroindustrial Consolata), established in Cafelândia City, Paraná State, Brazil is present in more than 60 countries with high quality products guaranteed by certifications ISO 9001, BRC - Food Products and APPCC/HACCP - Hazard Analysis Critical Control Points. Adding value to the commercialized products based on the food safety, respecting cultures and quality of life of all people, Copacol completes 52 years of foundation and 32 years of experience in foreign markets, today present in the 5 continents. Founded on October 23, 1963 by Father Luís Luise and another 32 immigrant farmers from the states of Santa Catarina and Rio Grande do Sul, Copacol (Cooperativa Agroindustrial Consolata) was created with the objective of realizing the distribution of electric energy to the members . 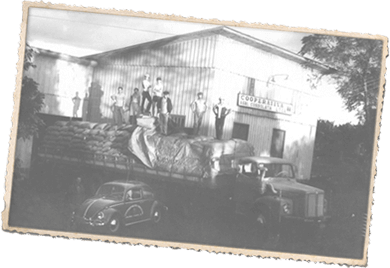 Six years later, in 1969, the Cooperative was dismembered from this sector to specifically serve agriculture, which at that time stood out in the production of beans, rice, corn and coffee. 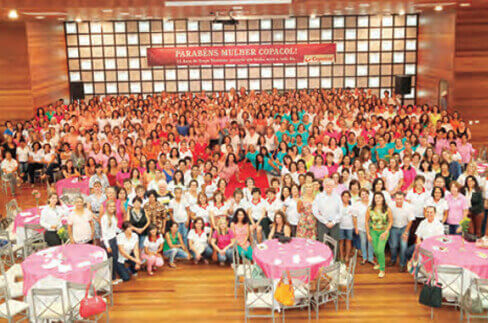 With the objective of integrating women into the activities of the Cooperative and the community, Copacol promotes courses, lectures and activities aimed at promoting the personal and entrepreneurial development of women through the training program of the Copacol Women's Groups, which began in 2001. Encourage culture, sport and education. With the participation of 20 thousand children and adolescents until 2018. Among the actions, social projects aimed at children have contributed to the cultural, educational and sports education of the children of associates, employees and residents of communities throughout their region. 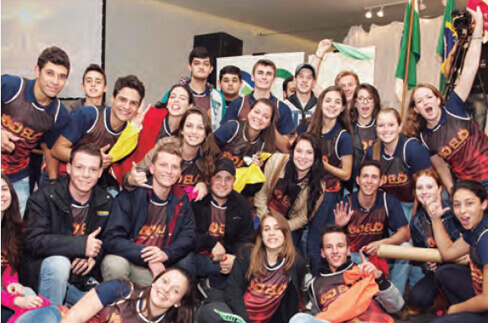 The magic of the "Busão da Imaginação" (Imagination Bus), adapted for storytelling, added to the sponsorship of projects promoted by the prefectures of the region, has been contributing to the development of future generations.